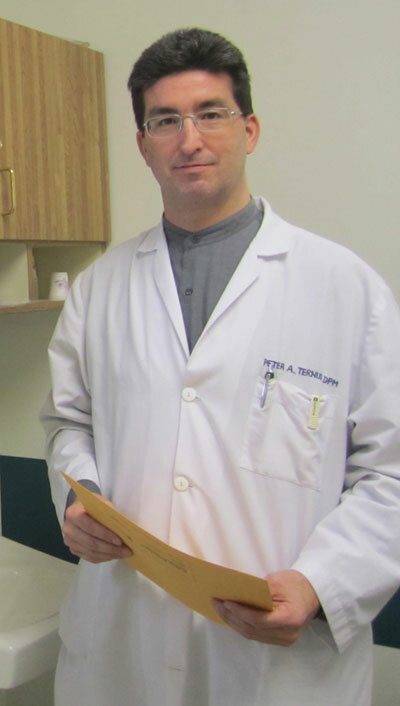 Dr. Peter Ternus received his Doctor of Podiatric Medicine (DPM) degree with honors from the California College of Podiatric Medicine in 1994. He then completed a three year residency program which consisted of a year of medicine rotations and biomechanics training, followed by a two year podiatric surgical program. He is board certified in foot surgery by the American Board of Podiatric Surgery and a Qualified Medical Evaluator (QME) for the state of California. Dr. Ternus is on active staff at San Leandro Hospital, Eden Hospital, St. Rose Hospital and Kindred Hospital. He works closely with internists and general practitioners as well as other specialists in infectious disease, vascular surgery, neurology, rheumatology and nephrology. This allows for complete care of the patient, including those with complicated medical problems. When he is not working, Dr. Ternus's favorite activity is spending time with his wife and two young daughters. He also has a passion for automobile racing. He currently races in the competitive spec miata class with the Sports Car Club of America (SCCA).